Every meat eater loves a steak grilled to perfection or the classic BBQ grub of burgers and hotdogs. But there comes a time in every budding pitmasters life when they move on to the big guns of backyard cooking and try to tackle ribs, briskets, and pulled pork. For this low and slow style of cooking, you’re going to need the right tools. 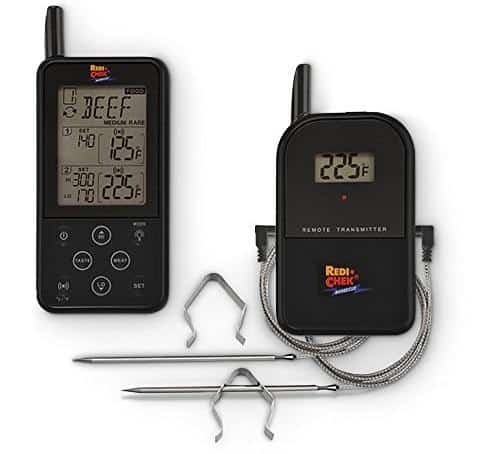 One such tool is a thermometer, and choosing the best dual probe thermometer for BBQing and smoking meat means your task of achieving legendary status among your guests will increase significantly. Firstly, a dual probe thermometer doesn’t necessarily mean there are just two probes – I’ve seen some with six probes. What it does mean is that there are at least two and each one serves a slightly different purpose. Each of the probes will be connected to an LCD display unit via long heatproof wires. This is so the probes can be left in the grill while the display unit is left in a place it can easily be read (like a nearby BBQ table). One of the probes will be a “leave-in” thermometer. And as the name implies, this probe is to be left in the meat the whole time the meat is cooking. With low and slow cuts of meat, you don’t want the internal temperature to rise too quickly or exceed your target temp. It’s therefore very important to be able to track this temperature and to also be able to do it without lifting the lid every five minutes. The second probe will normally be used to check ambient temperatures – this is best measured close to the meat and near grill level. 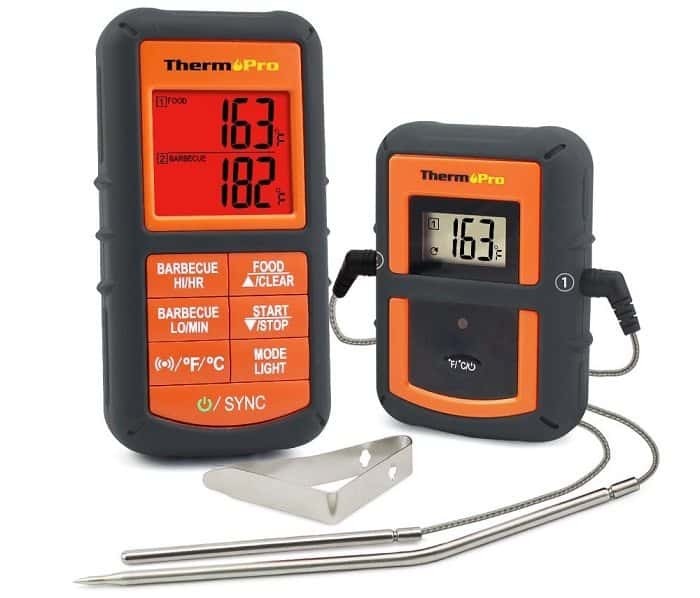 Yes, most grills come with some sort of temperature gauge built in for ambient/grill readings (normally in the lid), and these are great to give you a ballpark figure, but this reading will be the temp where the gauge is – which is likely a fair distance from the meat. The second probe will likely be stubbier than the leave-in probe and also have an attachment which aids in keeping it slightly off the actual grill. 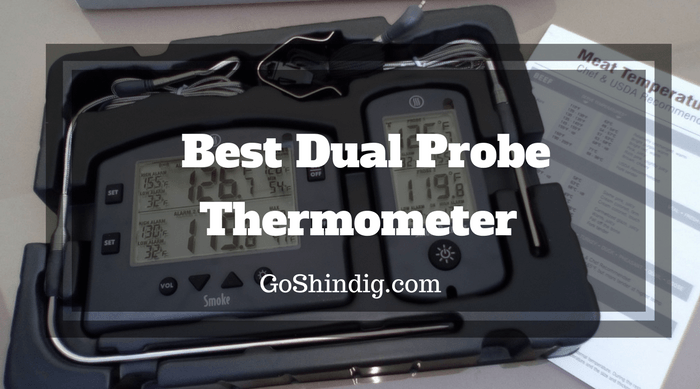 There are so many different types of thermometers available today that it must be a nightmare for someone new when looking for the best dual probe thermometer to suit their needs. So below we have given a quick outline of our top 5 with a buying guide near the bottom of the article. In general, BBQ accessories are pretty expensive; different grills, firelighters, a dutch oven, utensils, etc. all quickly add up. For what you actually get for your outlay though, I’d have to say a dual probe thermometer is one of the best value for money accessories you can buy. Are they cheap? Well, that’s all relative but considering some of the very best thermometers are available for under $50 I’d say they are cheap. 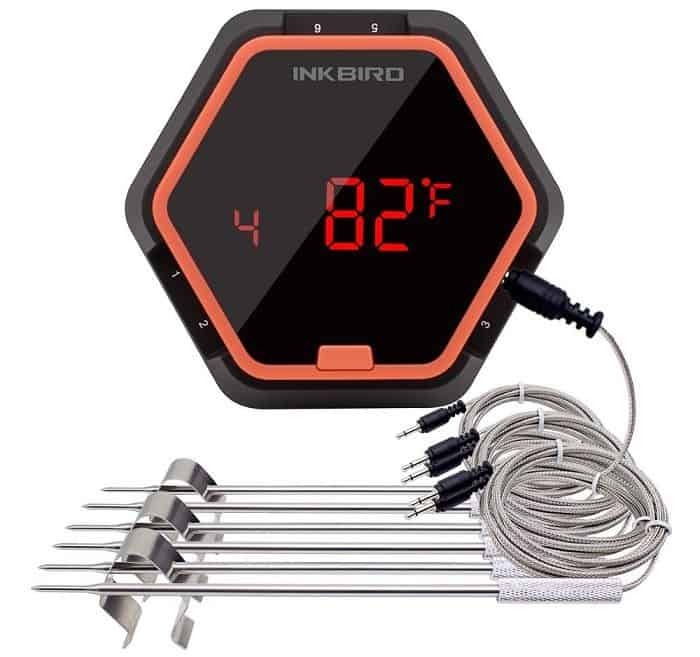 Low and slow cooking is what BBQ and smoking is all about and a dual probe thermometer will be used for every one of these cooks. It’s money you will not regret spending! If you’ve been bitten by the BBQ bug like me then it’s highly likely you’ll have more than one chunk of meat on the go at the same time for a BBQ party. So the options are to buy multiple thermometers or to buy one that allows you to plug in more probes. Each method has its pros and cons so buy what suits your grill set-up best. 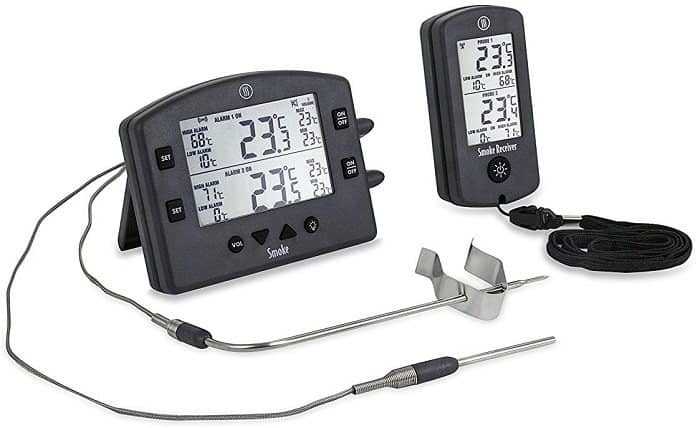 Multiple thermometers give you more flexibility because if you’re using more than one grill it doesn’t matter about the distance between them This flexibility comes at an extra cost however and means that you’ll need to carry around multiple receivers or have several apps installed on your phone. What you’re looking for when considering WiFi or Bluetooth capabilities is the range – how far can you wander off from the grill and still be confident you’ll get a signal. Unfortunately, I have to say you have to take the range given by manufactures with a huge pinch of salt. Maybe manufacturers test in ideal conditions that are unattainable by the average backyard grill jockey, because I’d hate to think they are outright lying. Radio frequency is my preferred feature over WiFi or Bluetooth simply due to the simplicity it offers. Radio frequency dual probe thermometers will generally already come coupled, meaning the receiver is already set-up, so you are good to grill right out the box. Synchronizing a wiFi or Bluetooth enabled device is normally a lot trickier and I have an internet engineering degree. Someone like my father, who has just figured out his phone has an alarm clock app has next to no chance of working it out. Radio frequency lets my better half grill without me having to give over my phone and also allows me to lend it to friends hassle-free. It’s pretty simple what I mean by alarms for certain ranges. If your meat or grill gets too hot or cold you want to be warned about it. Any dual probe thermometer worth its salt will have this feature. Ideally, you’ll have the option of setting the alarm to only sound from either the main display or the portable receiver that comes with it. – If you loving BBQing or smoking outdoors, it’s only a matter of time before you get caught in the rain. These long cooks can take 15 hours and even if the sun is shining when you first fire up the grill, over this kind of time period and after many uses, it’s inevitable the rain will get you. So make sure you buy a dual probe thermometer for outdoors and that it is either waterproof or splash-proof. – For many of my long smokes, I start the process the night before I want it to be eaten. This is pretty standard as you’ll want your guests to be eating at a reasonable hour and while the sun is still out. So having good backlighting on my digital display is a nice bonus. It’s not a deal breaker as I have grill lights I can use or turn on the yard lights. However, it is a nice feature for people who have their grills down the bottom of their yard where they have no lighting, or for people that want to do long smokes on camping trips. – Probably the most important things to look for in a piece of equipment like this is build quality, and yet it is one of the hardest to assess. Grilling equipment seems to take a lot more knocks than standard cooking equipment. I don’t know if this is because of how well grilling and drinking go together or whether it’s deemed a more macho cooking style that people simply mistreat stuff. Whatever the reason you’ll need to guess the build quality before buying as you’re unlikely to be allowed a trial period on thermometers to test the quality. 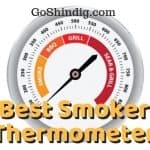 So other than just guessing, your best bet is to read articles like this one or ask people on facebook BBQ groups, this will give you a much better idea of build quality than guessing alone. You’re going to be cooking outdoors where you’re not always going to have access to an electrical point so battery life is important. Especially as dual probe thermometers will be used for long cooking sessions. How Long Does It Take to Smoke a Brisket?